Celebrating ‘The Works’ – 30 years of the B&A, Graphic Studio Dublin, print commission. This year, our long-standing members, Behaviour & Attitudes celebrate 30 years of commissioning Irish artists to make original fine art prints with Graphic Studio Dublin. The prints are given to their clients as gifts, as an alternative to generic Christmas presents. In an Irish context, the longevity of this commissioning practice is significant. The partnership between B&A and Graphic Studio has also been recognised through the Allianz Business to Arts Awards. ‘The Works’ exhibition of all original prints created through this commission runs from 14th Feb – 9th March at Graphic Studio Gallery, Through the Arch, Cope Street, Temple Bar, Dublin 2. 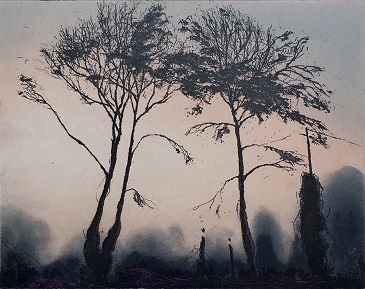 The selected artists are either exceptional printmakers and members of Graphic Studio, a non-profit printmaking centre of excellence, or established painters who work collaboratively with the studio to make prints, that are then printed by hand at the studio. The commission provides financial support to artists and helps to fund the studio, an organisation that delivers tangible assistance to artists, by delivering subsidised studio space, access to printmaking courses and technical facilities for artists to make prints. Commissioning achieves a number of objectives for B&A – signaling an appreciation of their business relationship with clients, demonstrating synergy between business and the arts, and highlighting talented Irish artists. To date, 30 artists have been commissioned to make 79 different images that are printed using various original printmaking processes. Artists who make up the thirty years of this unique commission include William Crozier, Cliona Doyle, Richard Gorman, Ailbhe Barrett, Hughie O’Donoghue, Pamela Leonard, Gwen O’Dowd and James McCreary to name just a few. A catalogue has been published to accompany the exhibition, with an introductory text by Aidan Dunne. Available here. Fundraising Fellows Anna McCarthy (Development Manager, Helium); Muriel Foxton (Marketing & Fundraising Executive, Temple Bar Gallery + Studios); and Chandrika Narayanan-Mohan (Marketing & Fundraising Executive, Fishamble: The New Play Company) have graduated from the Fundraising Fellowship, Dublin programme. The programme, which is a joint programme created by Business to Arts and Dublin City Council Culture Company (formerly Dublin’s Culture Connects) aims to develop the pool of fundraising expertise in Dublin-city based cultural organisations. The graduation was held at 14 Henrietta Street. 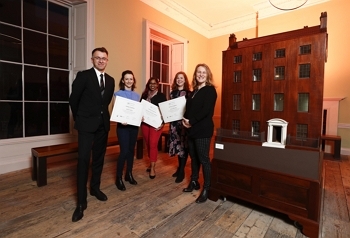 As part of the 24-month Fundraising Fellowship Dublin programme, the Fellows worked in a fundraising or marketing & fundraising role within an arts organisation. The programme saw Dublin City Council Culture Company fund 50% of each role, with the partner organisation matching that figure. Over the two years, the Fellows took part in an intensive programme of training and mentorship, worth in-excess of €80,000 per institution led by Business to Arts, Dublin City Council Culture Company and industry experts, to build capacity and to diversify revenue streams. As part of this, leading Irish and international experts offered masterclasses to develop knowledge and understanding, offering practical and real life expertise. The Fellows also worked with Calcutta Run, Common Ground, Dublin Cycling and 100 Archive imparting their expertise to these organisations, thus increasing the reach of the programme to community organisations in Dublin city.